DECENT Web App Demo available for everyone! If you follow our news closely, you might have noticed a huge buzz, from us and our supporters, about project DECENT was developing for quite some time. 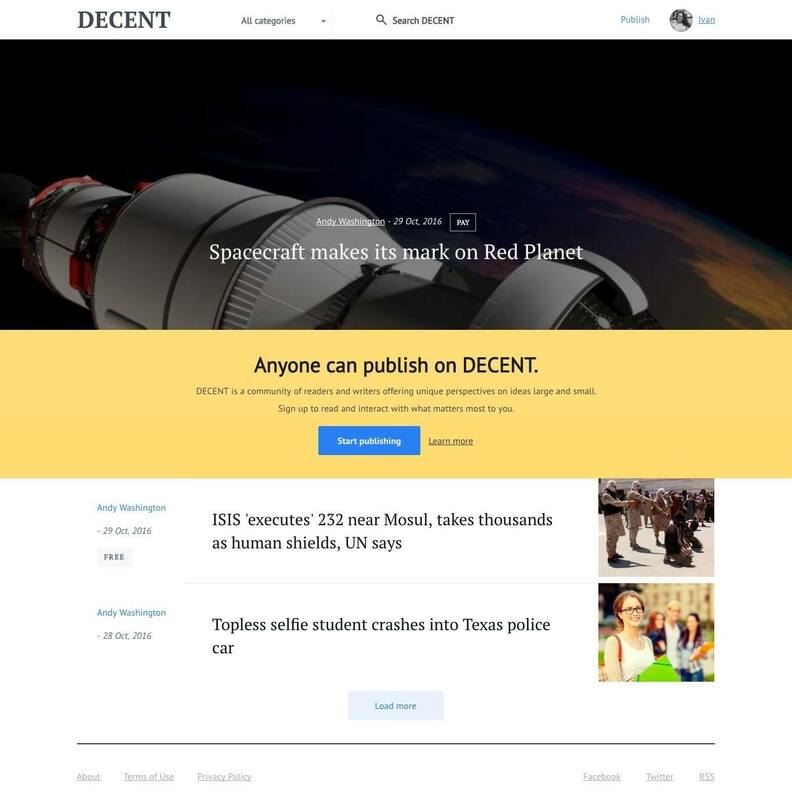 In this precise moment, you are free to use demo version of DECENT Web App, a blogging platform that allows you to put out and monetize articles. Profile options provide you with few accommodating features. 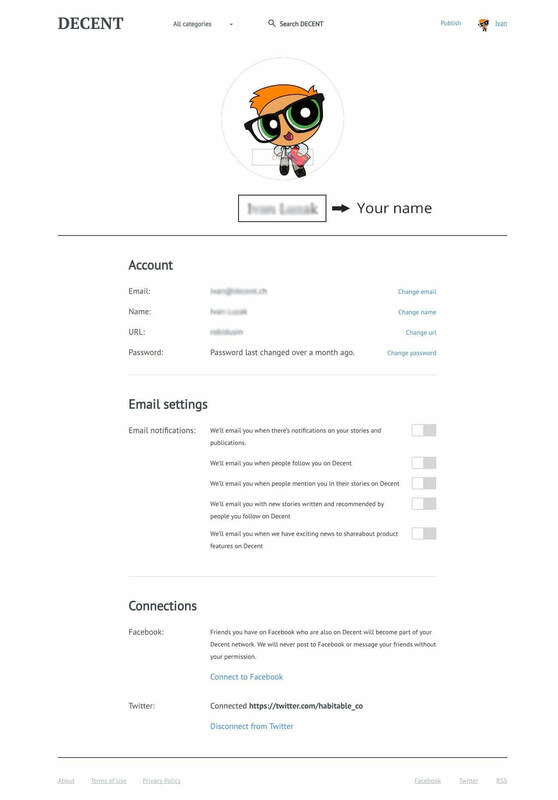 Beside picking and uploading your profile pic, you may optimize the role of e-mail notification system. You may also allow the system to inform you about other people, who share your article around social networks, therefore boosting your visibility and promoting your name. Being done with streamlined account settings, proceed to publishing your work. In top left corner, search bar lets you browse via tags every article must have, or simply by writing down the exact, or approximate title. After loading the page, you click on the ‘sign up’ in the top right corner. After submitting your limited personal info and, thus creating an account, you may begin to write or post an article by clicking on the ‘start publishing’ in the blue box, right in the middle of the main page. When transferred, you may clearly see blank spaces to fill out – ‘Title, Title Image,’ which are self explanatory, and ‘Tell your story’, the box you insert your text in. 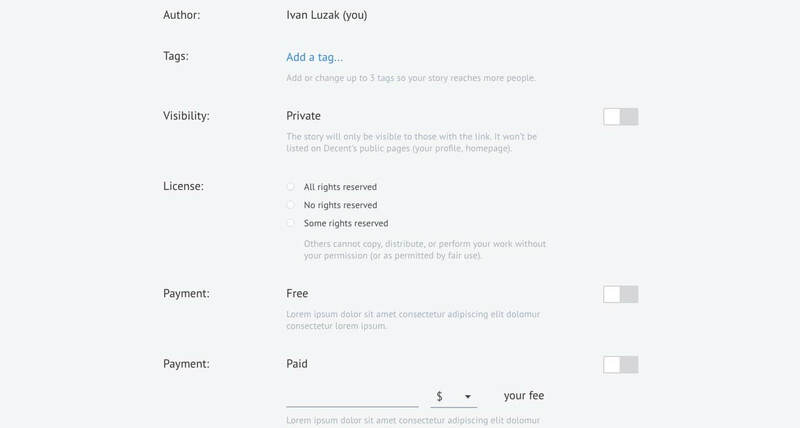 Scrolling down, you may choose from the specific options; adding tags for easier search, adjusting private/public settings, licensing, and whether you want to keep visibility of the whole text, free of any charge, or you decide to price the full article, with just a small portion free to read. But since current version of app isn’t working under blockchain protocol, demo allows for a certain extent of experimentation, temporary excluding payment options. Also, in future, you’ll be able to link your DECENT Network account with your profile on Facebook or Twitter, since for now the connection is temporary disabled. Web App prototype serves as a presentation of publishing system and its core functionalities. Bear in mind, although public, it’s still under development and maintenance. For the time, be proud of your article, essay, short story or a snippet of novel and share it with everybody as a part of exciting experiment entailed to decentralized content distribution.